The purpose of this post/poll is twofold; one is to present information that is known about the natural biology of hermit crabs (Coenobita spp. ), and how it relates to the effects of regular bathing. The second purpose is to find out if such information will cause some crabbers to change their mind regarding the practice of actively bathing pet hermit crabs. This is a repost of my original. A minor change in the wording of the poll question had to be made and this was the only way to edit it. I apologize for the inconvenience. Many veteran and novice crabbers alike engage in the practice of actively bathing their hermit crabs frequently, some as often as once or twice per week. Most adopt this practice because it is printed on care sheets (like the one FMR puts out), they hear about it from other crabbers in online forums, or read it in a hermit crab care book. 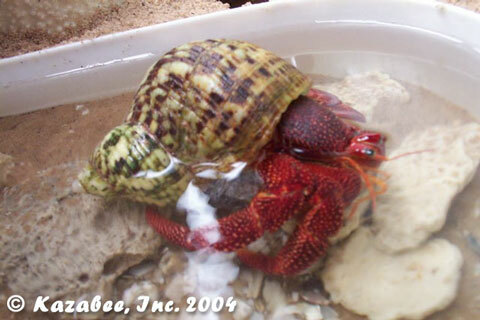 The idea behind bathing is that hermit crabs as a genus were once aquatic animals that have adapted to terrestrial life. The thought is that regular bathing has the benefits of helping them keep their gills moist, keeping the crabs well hydrated and cleaning out their shells of dirt, debris and feces. Many have also adopted the practice of adding Stress Coat to the bath water for the moisturizing benefits of the aloe contained in it and the thought that it will help condition their exoskeleton and replace some of the natural oils and slime coating they may have in the wild. This can be easily accomplished by offering an appropriate and varied diet, including some whole fish (like sardines in spring water or other fish with skin intact, just be leary of fish known to have higher mercury levels, or fish that has been processed or cooked). Commercial diets like FMR also provide for essential oils. Vertebrate feces, such as that from a tortoise, can also be beneficial in providing additional nutriment in the form of undigested plan matter, animal proteins sloughed off from the GI tract and beneficial bacteria found in their digestive tract. One caveat here is to use only feces from a healthy animal that has been screened for parasites; though the gastric mill of the crabs likely provides adequate defense to most common parasites. (Adapted from Greenway 2003, pg. 18 under “Feeding and Diet”). Another use for Stress Coat is as an aid in rehydrating/rehabilitating injured and/or dehydrated specimens, which I will comment on later. It has been well documented that the more inland species prefer dilute water unless they are depleted of salt. (Greenaway, 2003 as referenced from de Wilde, 1973). This would explain reports by crabbers who actively bathe their hermit crabs that even their C. clypeatus (considered a “more inland” species) have been observed or noted to have “drained” their salt water dish on a regular basis. Certainly crabs will increase water intake prior to molting, but for C. clypeatus to frequently drain the salt water dish is likely an indication of salt depletion due to frequent bathing in water hyposmotic (lower in comparison) to their blood and body tissues. This information is a very brief summary of the information found in the article linked above starting on page 16, column 1 with the heading “Salt and Water Balance”. “In aquatic species adjustments to ion content are made principally by salt transport across the gills, and the renal organ makes only a minor contribution. In terrestrial animals the gut and renal organs become the main sites of ionic regulation. Source: Biology of the Land Crabs, Burggren and McMahon, pg 213. Since we do not know the long term effects on their body systems and organs of the wide swings in salinity levels that can occur with frequent bathing, perhaps we should make adjustments to the captive care of these animals, with the goal being minimizing the overall disturbance of their salinity levels. Certainly, the crabs can adjust their salinity levels by selective drinking/bathing in their habitat, and through the promotion of evaporation (Greenaway, 2003), but again we don’t know the long term effects of wide swings in salinity levels on their osmoregulatory systems overall and specifically their gut and renal organs. 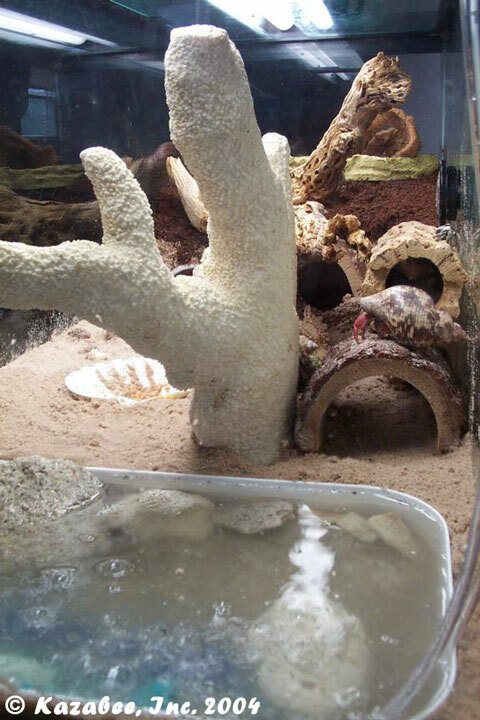 Furthermore, one of the world’s leading experts in herpetology and captive animal husbandry, Philippe De Vosjoli recommends against actively bathing hermit crabs for much the same reason in his book, “The Care of Land Hermit Crabs”. The next issue to be dealt with is in regard to adding Stress Coat to the bath water. Recently, a fellow crabber contacted the manufacturer of Stress Coat to ask about the safety of adding it to their drinking water. The answer was that it has not been studied and cannot be recommended. The crabber noted that many crabbers also add it to their bathing water. Again, the answer was this has not been studied and cannot be recommended by the manufacturer. One point that many Stress Coat bathers don’t often realize is that their crabs are likely exposed far longer than they think to the chemicals in Stress Coat. 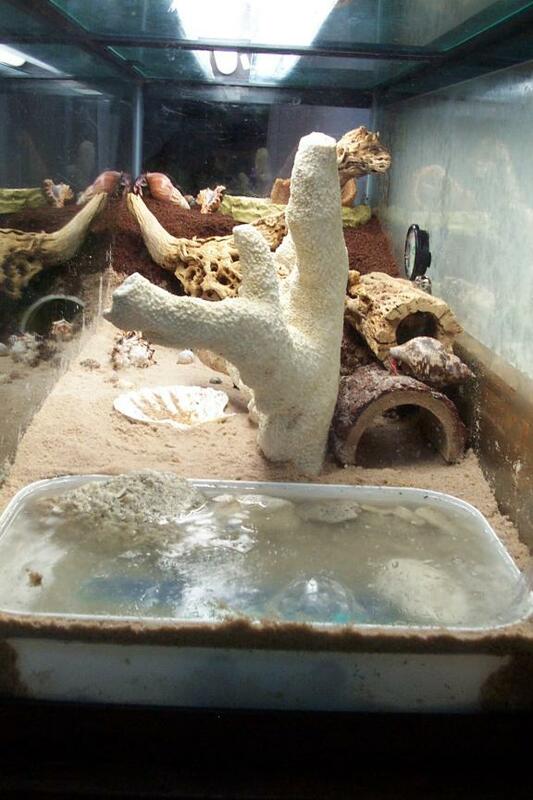 When their shell water is swapped out for Stress Coat treated water through frequent bathing, the chemicals are now in their shell water, and likely remain there for days after bathing, if not straight through until the next bath all together. Even if the crabs add to their shell water, all they are doing is diluting the chemicals. If they are able to partially or fully submerge themselves in the drinking water (salt and fresh) in their habitat, then some of the chemicals no doubt wind up in their drinking water. Even changing water every day as most crabbers do, you are likely to wind up with some chemicals in the drinking water on a day to day basis in a set up with multiple crabs, as each will visit the water dish on their own schedule. 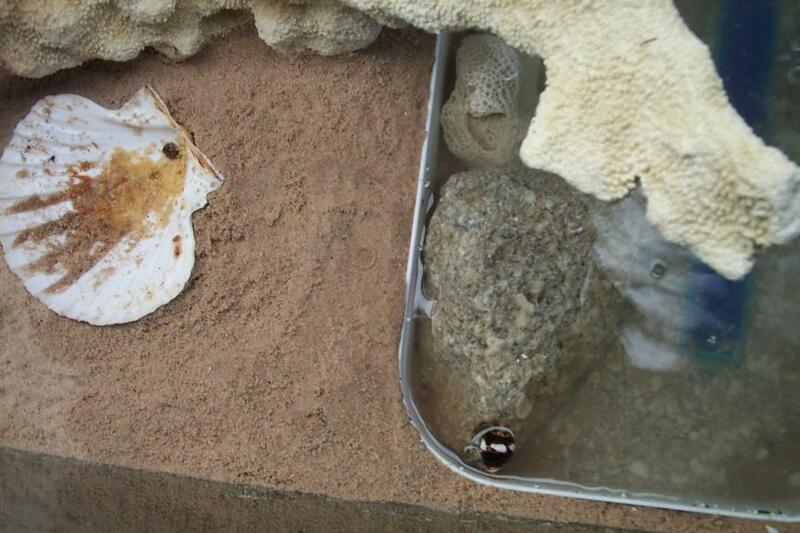 Chances are somebody with Stress Coat water in their shell will visit the water dish on a daily basis. With these thoughts in mind many crabbers, including myself, have opted for a more “passive” method of bathing our hermit crabs. That is, providing basins of salt and fresh water large and deep enough to allow the crabs to at least partially, if not fully submerge themselves in them. One issue here is that you need to provide adequate climbing surfaces (i.e. rocks, coral, etc.) in the basins to ensure that even the smallest crabs can climb out from the bottom. Some crabbers, including myself, have added a filter to their basins in order to cut down on daily maintenance. There are several filters that can work for this application, but you need a water depth of about 3″ to accommodate them. Penn Plax has a Small World filter that operates off of an air pump, and they also have a submersible filter called the Sand Shark. I have tried both and prefer the Sand Shark. It is only a little more than the Small World once you factor in the air pump you need for the Small World, is much quieter, and circulates water better, creating a sort of wave motion effect. Other brands that offer similar filters are Fluval, Duetto and ZooMed. The most common application for these is in semi aquatic terrariums for turtles, frogs and other semi aquatic creatures, and most have an adjustable flow rate, making it possible to use them in relatively small basins. To find appropriate sized basins, measure your habitat and come up with a reasonable size that will fit and allow for at least partial, if not full submersion. Then visit your local pet store and look for that size dish, or visit the tupperware isle at a local department store and measure the dishes until you find some of appropriate size. One point to note if you switch to a filtered basin, is that you will lose some water through evaporation and will likely have to replace some every few days. Take care to monitor the salinity level of the water to keep it within an acceptable range for seawter (generally considered 1.020-1.024 specific gravity). I usually add fresh or brackish water to replace evaporative losses so as not to increase the overall salinity. You can monitor this with a simple hydrometer purchased at a pet store that handles salt water fish at a cost of $10-12. One of our small Ecuadorians, S’mores, taking a swim. After we redid the tank, he went under water, along the bottom of the basin , then out to the other end of the tank and back into the basin again about 4 times. He then did a full lap around the outside of the basin– he was really digging it! As a matter of fairness, active bathing may be acceptable if one cannot provide for passive bathing for the crabs in their habitat. Active bathing would be preferable to not bathing at all, especially if the crabs have small, shallow water dishes, or in some cases a small shell dish with only a moist sponge (the latter of which I certainly do not advocate), and/or if the humidity levels are low or borderline in the crabber’s home and/or the crab’s habitat. 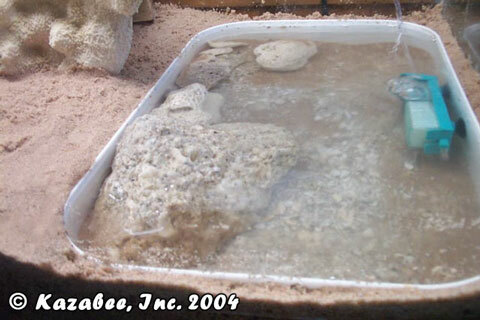 If active bathing is deemed necessary, care should be taken to minimize the overall disturbance the crabs experience. This could mean modifying your practices by bathing them less frequently, cutting down on the frequency of Stress Coat use or limiting it to use for injured specimens or those in need of rehabilitation/rehydration, and lastly adjusting the salinity of the bath water to try to more closely match what is likely in the shell of each species; for example, bathing C. perlatus in full strength salt water as opposed to fresh water. There is a chart in the Greenaway article referenced above that shows the relative salinity levels for each species (page 17, table 3). How long does the Stress Coat treated water stay in my crabs’ shells after they are bathed in it? Are they exposed almost every day to Stress Coat water and the chemicals in it as a result of my bathing because it is left in their shell water between baths? We know crabs ingest their shell water from time to time, they will also absorb chemicals through their skin. Also, if they readjust by submerging in their drinking water, the Stress Coat chemicals are likely to wind up there as well. How much and how often do they actually drink when left to their own devices? Are they getting a bulk of their weekly drinking water intake done at bathing time, causing them to ingest Stress Coat and its chemicals on a regular basis? What is the potential long term effect of wide swings in salinity levels caused by once or twice weekly bathing? 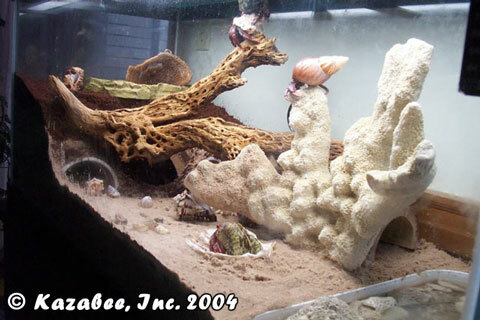 What is the long term effect on the bodies of hermit crabs of constantly having to readjust their levels– not minor adjustments that occur through their own natural bathing and drinking behaviors, but major adjustments necessitated by shell water constantly being hyposmotic to blood levels due to frequent bathing? Give yourself honest answers to these questions. We have the responsibility to care for these animals to the best of our ability. This should include simulating their natural environment and giving them the facilities they need to properly care for their own needs in as natural a manner as possible.